Mitchell Smith is a veteran with a long-time dream of providing mentorship and assistance to youth in Jacksonville. After looking into various ways that he could help the community, Smith arrived at an idea to provide a gymnasium where the youth could have a home, keep fit, and gain exposure to nutrition and healthy living. He explored several areas and arrived at an ideal location servicing several neighborhoods around the Arlington side of Jacksonville. Smith demonstrated his commitment to his business idea by investing his own money in purchasing a facility with the capacity to achieve his dream. However, outfitting the gymnasium at the standard Smith had in mind required a significant amount of money and he needed assistance in raising it. So, armed with his ideas, optimism, and belief in the youth of the Arlington neighborhood, he took his case to the Florida SBDC at the University of North Florida (UNF). Smith’s consultants helped him articulate his ideas in a business plan and helped him establish his preparedness for a business loan. He also needed help with generating realistic financial projections to enable him to set operating budget expectations, as well as provide the lender his financial plan. His consultant helped him identify his startup costs and understand his potential clientele to revenue ratios. She also helped him establish his potential operations financials and create realistic projections. The result was strong enough that his business loan was approved on the first pass. 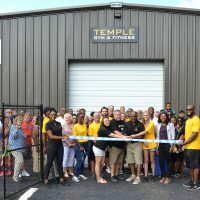 Now, Smith is set to grow Temple Gym & Fitness and build up the youth, just as he has always dreamed. "The [Florida] SBDC helped me articulate my business idea and fulfill the standards the lenders expected of me to make my loan application successful,” Smith said. “Without this loan, it would have been much harder to achieve my plans for my business. I would definitely recommend the [Florida] SBDC to anyone in business looking to grow or successfully launch an initiative."